What Kind of Person Goes Giraffe Hunting? Today, I came across exactly the kind of information that makes me wish I had never heard of the internet. A story about hunting white buffalo in Texas lead me to the horrible realization that there are people out there that pay big money to hunt not only the white buffalo in the picture, but giraffes and elephants. What for? American Indians and Native Canadians are rightfully furious about hunting the white buffalo which of course, is sacred to them. I thought white buffalo were scarce and unusual. Isn’t that what the plaque says at the Winnipeg Zoo? In my google adventure for today, I made all sorts of awful discoveries. You can go giraffe hunting, for example. These people at Safari Guides dot net are happy to take your money. 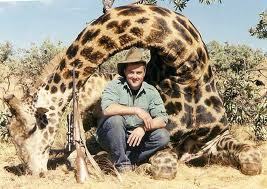 Again, why would you pay someone to let you kill a giraffe? It seems to me that its all a bit much. This company in Texas offers hunting packages of every description including the white buffalo and three different kinds of DOVE HUNTING adventures! Why dove hunting? What did doves ever do? Do you become more manly when you kill doves? I thought we were using doves as a symbol of peace. Did someone change that? Oh, I almost forgot to tell you; these hunting packages include free booze! According to their website, “There are no seasonal restrictions on hunting the Zebra in Texas, which makes it a suitable trophy year round.” Could that be because since there aren’t supposed to be any zebras wandering around the Texas wilderness, nobody thought they would need any zebra hunting rules? Maybe. My favorite option might just be this little gem. “We typically let our hunters choose the method of hunting that they prefer”. Then there’s a list, which includes handguns. Yes. Handgun hunting. They can accommodate the physically disabled hunter as well as those hunters confined to a wheelchair. Handgun hunting of endangered animals from a wheelchair. I can picture it now. 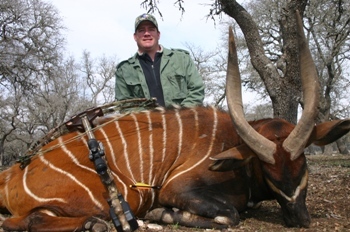 “Texas Hunt Lodge allows the opportunity to hunt and harvest the extremely rare Bongo you’ll want to hang on your wall.” I actually don’t know what to say about this, because it gets better, “if you don’t see a species of Exotic Game animal on our website which you would like to hunt, please let us know, and we’re fairly confident that we can locate it for you.” Then you can kill one to hang on your very own wall. Yeesh! Don’t get me wrong, I haven’t joined PETA or anything and I still stand behind Canada Goose. After all, fur trimmed hoods are extra warm and we are in Canada. Like, I am not a complete fool. I am aware that hunting is big business. I just always thought they were talking about deer and whatever plentiful game there happens to be where you are. You know, like wild boar and whatever. I guess I was taken by surprise with this white buffalo hunting story. 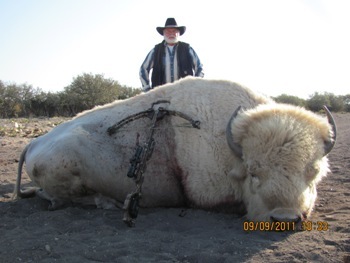 This is one sick person that would shot a rare white buffalo. What kind a person would do this. I can tell you what kind a person does this kind of thing a “White Man”. You “haters” are ignorant to the fact that Texas ranchers raise these animals to be harvested by hunters. If it were not for the ranchers and hunters, many of these animals would not exist. By the way, how do you think animals die? do they just lay down and expire after dancing through the tulips all their life. No. Every animal meets a slow and painful death due to old age and not being able to eat. They starve, get weak, and are ripped apart by predators while being eaten alive. Is that a better way to go than to get taken by a hunters bullet or razor sharp arrow through the lungs?